I really need to stop browsing aliexpress for new eye candy. all I can say is WOW! Well, that's not all I can say but....WOW. That is what you call space management lol. Great looking little mod Mamu...next stop DNA30? I can't believe that is under 2" tall. Very good mamu. Excellent work. Thank you for posting it. Many thanks to breaktru for his work with the 9v batt box and to him and retird for showing their stealth mods with the DNA20D. Before that, I really didn't have much interest in the tiny mod due to batt capacity, but they peaked my interest with it. So I got a bugaboo to do it with the 9v batt box and then to find stealth size aluminum cases and there ya go. I really don't think I can get much smaller now, but ya never know. Amazing work Mamu. Definitely like Jera's size and ergonomics... Truly appreciate your design genius and products performance. That is so cool. The smaller the better in this instance. Good job. So do you also organize the circus clown car when 20 clowns get out the car you were hired because now 25 clowns fit in there. That's just fantastic, love the box, love the size and the finish is outstanding. Cool, it's a cute little cube. Gotta hand it to Evolve, that DNA20 is tiny. Of course your handywork is worth a lot too. I'm so used to using metric now, the measurements didn't mean anything to me until I saw them in mm. My digital calipers are ~never~ on inches. 10-4 on the metric. Since getting into modding the parts and electronics mostly list dimensions in "mm". I remember not so long ago thinking that I would never give in to metric measurements thing but things have changed. Yes, I was a little put off by the metric system at first. I don't know about now, but we all were taught to use imperial units in grade school so that's what we got used to. My first exposure to the metric system was in college many years ago so I kind of warmed up to it since science and engineering is taught all in metric units. However, I was still using imperial units everywhere else. Now that I'm fully acclimated to metric units, I don't know how we Americans have put up with imperial units for so long. They really are quite cumbersome. I set the calipers on inches for that picture as a courtesy to those not familiar with metric, which is still the majority of the population in the US. If it was just for myself, it would have been set on mm. Nowadays I much prefer working in metric when it comes to modding as metric is far superior in accuracy and ease of use. However, I can flip between the imperial and metric systems with no issues and without thinking that measurement doesn't mean anything to me. Those tact switches I use in Jera need a 13/64" cutout as well as the connector needs an 11/32" cutout - you're not going to find an equivalent metric bit for that. I cut the acrylic window for the display 7mm x 21mm and the cutout for the frame is 23mm x 10mm. So it's a mixture between imperial and metric that I flip back and forth between. All my dremel attachments and drill bis are in fractions. Buying parts is a grab bag of whether it is designated in imperial units or metric units. I buy wiring by the foot, unless it's at places like aliexpress or hobbyking which is by the meter. All my modding drawings and templates and measurements are done in metric. I write my tutorials using imperial units as a courtesy to those not familiar with metric so they don't get confused. ALL my quilting templates and rulers and sizing and sewing is in imperial units. Go forth and be flexible guys - this is an imperial/metric cornfoozled world thanks to the good ol' US of A.
wow this is great work!!!! now where do i offer my virgin neighbor as a sacrifice to get this? but seriously this is one good work..
the name sounds familiar thou..
For sure, I can use both systems comfortably, I just like to get on my "we should have gone metric a long time ago" bandwagon. It's really not a big deal, but it did crash a Mars probe one time. You have those batteries in series or parallel? Hey mamu, another spectacular mod and well fit. Also good to see you here. As for the metric/imperial debate, I'm on the metric side of the fence, for precision it is key especially for small parts. But like mamu said, there are needs for both in the modding world and I like to mix US and EU parts in my mods, for tubing and other stuff. M3 threading is much finer than it's #4-40 equivalent, a 15mm tube will fit nicely inside a 5/8" brass tube, and the such. 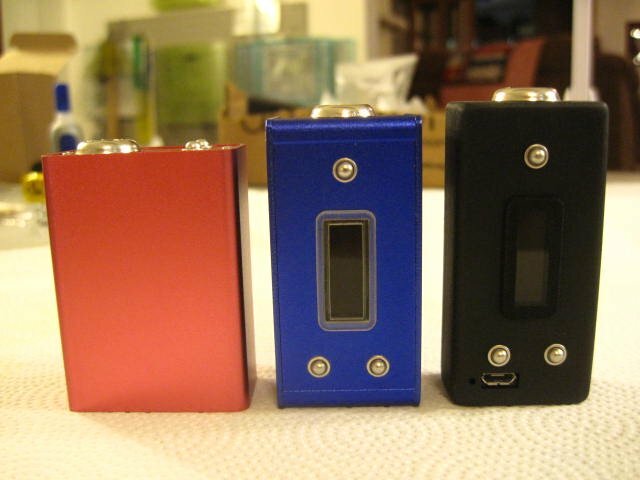 I have a dozen or so DNA20D style mods now with four of them being stealth sized. I really really need to stop browsing for new cases. Really, Srsly. LOL! Or, you can design your own. You can use Sketch-up for free and it can do the job. There's a number of shops in the US that will CNC or SLS something from an STL plot file for you. Sketch-up needs a module add-on to output the plot files, but it's free. Other 3D drawing programs can output those plot files natively. Typically it's cost prohbitive for only one or two units, but if you plan to build a number of them, it knocks down the unit price putting it within reason. Of course, it's hugely more expensive than something off the shelf, but there's nothing more rewarding than an enclosure that fits everything exactly to your own specifications. I did design an enclosure, but to have it made it would be around $50 for each one. And that was for a quote of 100. That was from a few USA shops though. A custom case would be great and the major advantage for me would be to have a case with all the cutouts done so I wouldn't have to dremel and drill the cutouts. That would save me about 2 hours of labor plus give my arthritic hands a break. My son is trying to talk me into buying a laser cutter. I do really enjoy though the variety of readily available enclosures. I like variety in enclosures as it keeps me from getting bored or burned out, so really no complaints there. I can usually get them down to $50 a unit for a quantity of 10 and that's about how many I build in a year. But yeah, it's not something you would want to pay on a normal production scale. For me it's not an option. I'm not willing to waste even a square mm of space. One of my big goals in mod building is to design the mod conform to my own specs as much as possible. I pay for it though. There's a lot to be said for conforming your design to off-the-shelf parts. I think I'm one of the die-hard few that is not willing to do that (if not the only one).